Quoted from Sindonews, Kodam XVII / Cenderawasih mobilizes all the potential power available to hunt down Armed Separatist Criminal Groups (KKSB) in the inland of Papua. This is done because of the rampant attacks and shootings that occurred in Papua, carried out by the Armed Separatist Criminal Group (KKSB) and the geographical conditions of the Papua region surrounded by mountains and dense forests and bordering the PNG country. 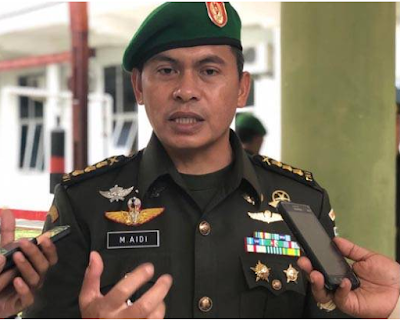 "Need to do special handling efforts in the form of law enforcement task force (Satgasgakkum) TNI-Polri," said Kapendam XVII / Cenderawasih Colonel Inf M Aidi in a written statement sent to SINDOnews, Wednesday (09/19/2018). According to Kapendam, looking at the situation of the operating area in the implementation of the Satgasgakkum duties and the analysis and concepts to be carried out, special efforts are needed with careful calculation. "However, the territorial approach in the form of community development and the social approach that has been carried out so far remains prioritized, while armed contact is the last choice," he added. Kapendam said, in the Papua region, especially in mountainous areas, there had been acts or acts against the law carried out by a group of people who took up arms illegally known as the Armed Separatist Criminal Group (KKSB).